Development | RSPaul Company, Inc. Founded in 2003, RSPaul Company has established itself as a regional developer, owner, and property manager of both residential and commercial property on the Central Coast of California. We have direct experience in land entitlement, land improvement, building construction, tenant improvement construction, tenant leasing, and day-to-day property management operations. Completed projects values have ranged from $600,000 to $16,500,000. Our principals handle all aspects of the development process. RSPaul Company's property buildings management operations total 216,000 square feet of commercial space across 15 entities with over 40 tenants. Problem Solvers: The Central Coast of California is viewed as one of the most difficult places to develop quality real estate in America. However, this difficulty has actually proven advantageous for our company. Because we are able to solve problems and meet the challenges of a difficult development climate, we have created opportunities worthy of development and that continue to be financially successful. Underwriting: Our company prides itself in the property it develops. We do not derive satisfaction or revenue from the quick building of property to sell for profit. Rather, we acquire property that has intrinsic location value, reasonably attainable entitlements, and property that we will hold for the foreseeable future. We underwrite the acquisition of each real property asset for its long-term intrinsic values and its cash flow generation potential. Hands-on: While we use third-party service providers, we are proud to be viewed as a hands-on management company. Our principals attend and preside over all meetings with entitlement agencies. We manage all construction, with a vast portion of it completed by our employed construction crews. We constantly monitor and control day-to-day operating and development costs so that we can deliver quality buildings and cost-effective property management that others cannot match. Future: Our company is actively looking to acquire real property assets in the western United States. We will continue to source property in highly desirable locations with reasonable expectations of timely entitlement, and with promise of sustained cash flow for years to come. The building and two contiguous acres of improved land are leased on a long term basis to Regional Transit Authority (RTA). The RTA provides county wide public transportation fleet and Runabout shuttle bus service. The two acres of contiguous land has recently been entitled for the development of 3 additional commercial buildings which will increase this property's leasable area by 50,000 square feet. The building is divisible into eight suites and has a total of 10 roll-up access doors. 175 Tank Farm Road is located at the corner of Tank Farm Road and Long Street in San Luis Obispo, CA. This building is wood framed with approximately 1,301 square feet of interior space and an 800 square foot outdoor patio. This building is leased to the Doggie Spa & Salon. 178 Suburban Road is a 8,651 square foot structure entirely leased to Stephen Ross Wines, Inc., a full service, acclaimed winery and tasting room. 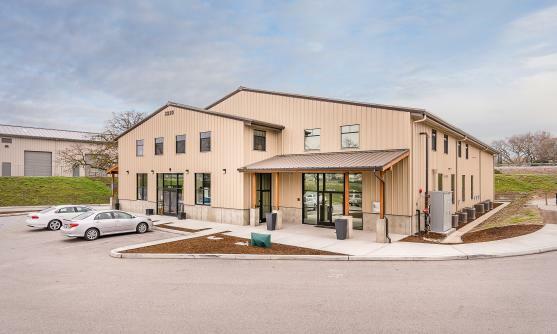 Situated on a .87 acre site, this 9,760 square foot building was originally built for Otis Auto Body. The building was acquired by RSPaul Company March 2011 and was determined that the ample lot size would allow for an additional 6,105 square feet to be built by adding a partial second floor and by enclosing the buildings drive aisle. RSPaul Company completed construction and lease-up of this 10,843 square feet commercial building in 2015. The building is 100% leased to two tenants; Scott Laboratories/ETS and Knights Carpets. Lizzie Court is a 4,978 square foot custom home completed in September 2009, located in the Bowden Ranch subdivision of San Luis Obispo, CA. RSPaul Company actively seeks additional property acquisitions. Contact us for more information.